"NYT headline writers what are you thinking? 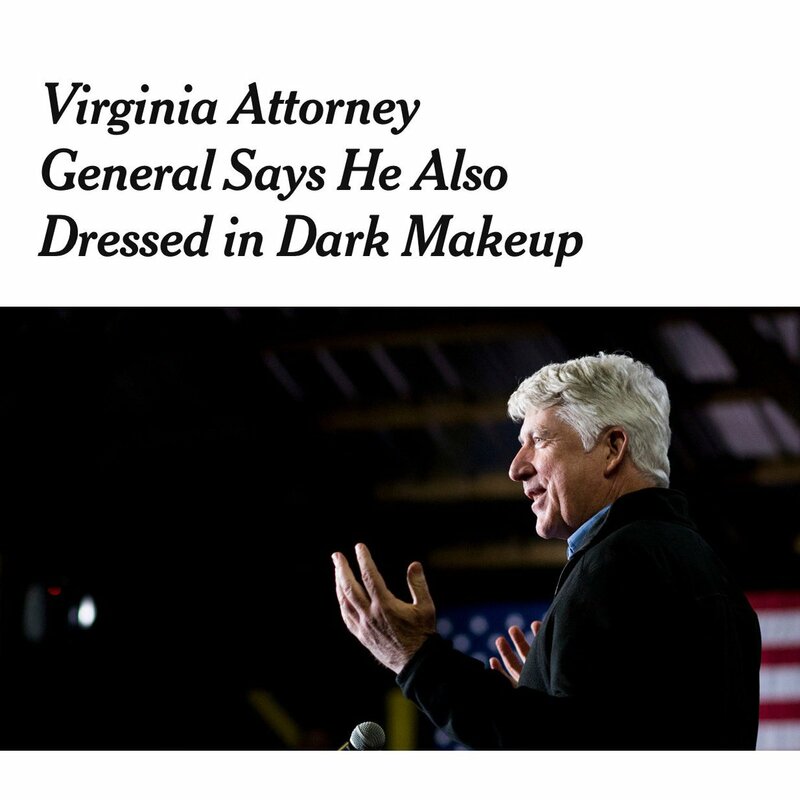 “Dark Makeup” "
The bizarre state of Virginia politics got even nuttier Wednesday when the state’s Democratic attorney general admitted to wearing blackface nearly 40 years ago when he was a 19-year-old college student. This came on the heels of Governor Ralph Northam’s blackface/KKK yearbook photo — a photo he denies being in while admitting he put on blackface for a Michael Jackson costume — and Lt. Gov. Justin Fairfax’s sexual assault allegations. In its story about AG Mark Herring throwing another tire onto the fire of the Virginia Democratic Party, the New York Times made a curious editorial decision. Virginia Attorney General Mark Herring acknowledged Wednesday that he put on dark makeup and wore a wig while an undergraduate of the University of Virginia in 1980, becoming the second statewide official here in the last week to admit imitating an African-American and sending an already-stunned state capitol reeling. Well, the soft-peddling of Herring’s use of blackface resulted in the Times getting immediately rebuked by journalists, reporters, and other media figures. "dark makeup and a wig"
The Times quietly changed the headline of the piece to include “Blackface,” though the paper didn’t initially include any editor’s note explaining the edit.